Well, it was really only a matter of time before the Avengers broke out into an all-out battle. They already had a bunch of little squabbles in the first movie, and in the second movie, things only got marginally better. It's quite a shame that T'Challa had to be inducted into the world of superheroes at a time when everyone's involved in a battle royale, but how else is he going to bring his father's killer to justice? But, at least the mystical tribal power of the Black Panther has been passed down to the right person. Now, it's your turn to step into the role of the Black Panther with this Captain America: Civil War costume. 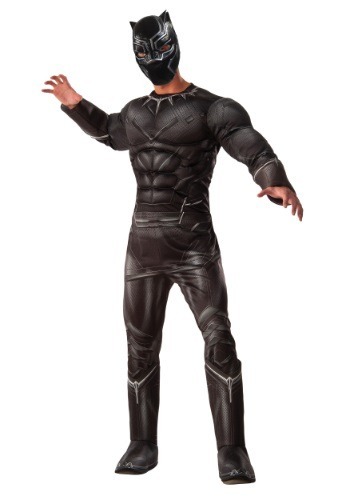 Based on the suit worn by Chadwick Boseman, this Black Panther costume comes with a polyester (not vibranium, sorry buster) jumpsuit that has printed details and fiberfill muscle definition in the chest. When you suit up in it, you feel a bit like a regal king and a lot like a ferocious jungle cat! But, fortunately for you, you won’t have to actually ingest the dangerous wakandan herb… deadly poisonous to those not of the royal bloodline, we’re safely assuming that you’ve already earned the powers!